Davita Lichttherapie prescriptions are currently not available via our online consultation service. You can, however, request an online consultation for light therapy. 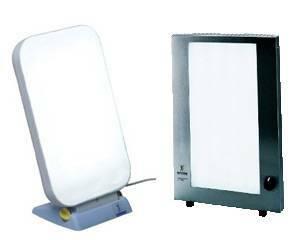 Light therapy has become increasingly popular in the last few years as a treatment for a wide range of medical problems related to daylight exposure. Research has made it more and more evident that daylight has a large impact on our health. Lack of daylight can lead to sleep disorders, jetlag, lack of energy and depression. Light therapy can provide an effective solution to these problems. The Davita LD 72 is Davita's basic model. It has a connected load of 72 watts and reaches a light intensity up to 15,000 lux. The recommended daily treatment duration is approx. two hours. The LD 72 allows light therapy treatment at a distance of 55 cm with a clinically proven and medically efficacious light intensity of 2,500 lux. Davita's second model is the LD 110. It has a connected load of 110 watts and reaches a light intensity of up to 25,000 lux. The Davita LD 110 is recommended for daily use of approx. one hour. The LD 110 allows light therapy treatment at a distance of 45 cm with a clinically proven and medically efficacious light intensity of 5,000 lux. With a connected load of 220 watts, the PhysioLight LD 220 is Davita's deluxe light box. This device allows light therapy treatment at a distance of 50 cm with a clinically proven and medically efficacious light intensity of 10,000 lux. The PhysioLight LD 220 is the most powerful unit in the Davita range.